With today’s technology, concrete doesn’t need to be a dull gray boring slab. We can make sure you’re concrete is pleasant and attractive. Some of the services we provide are listed below. 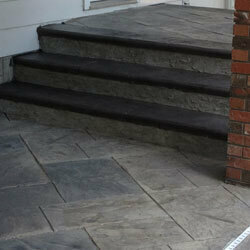 Before the fresh concrete has set, it can be imprinted with stamps to mimic cut stone, rock slabs, and so forth. Colours are added to create natural beauty with stunning effects. We have perfected a system that has proven itself to last in our harsh climate. This process entails using a chemical densifier to dramatically strengthen the concrete, then grinding and honing with progressive grits of diamonds to create a dense, mirror-like finish. 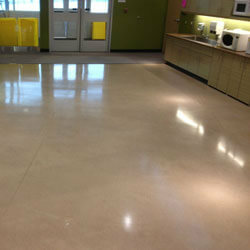 Polished concrete is environmentally responsible, showcases the beauty inherent in concrete, is a dust-free procedure, and provides quick floor turnarounds. When your concrete has deteriorated and you can’t imagine putting up with the intrusiveness of removal or replacement, try a coating or overlay. 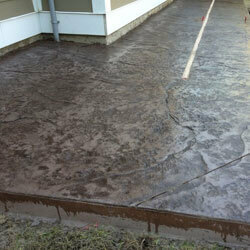 The quarter-inch thick overlays have the appearance of stamped concrete, and we use MIRACOTE decorative coatings. 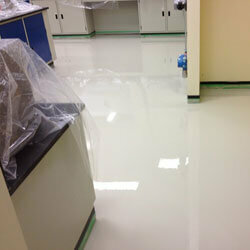 Although similar to polished concrete, sometimes it is more desirable to seal the floor with an epoxy/urethane system to provide a “bullet-proof” chemical and stain resistant armour to the floor. This is also a dust-free procedure. 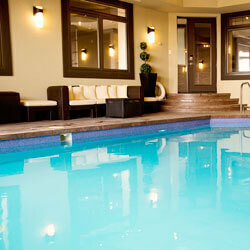 Using concrete for your pool ensures that your pool can be customizable and durable. A concrete pool typically looks more attractive than vinyl, for example. Though it takes more time to install, if you’re going to go all-in and get a pool—why not ensure that it’s the best it could be?